In Indian art, most detached heads sculptured in stone have been broken off their bodies, as in the case of [EA1963.27, EA1961.138, EAOS.61, and EAX.245]. 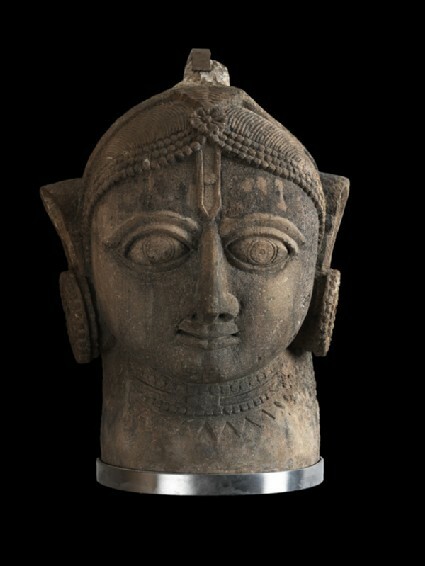 In Rajasthan or Gujarat, however, heads such as this one replaced the tip of the central spine of each of the four sides of the śikhara (“tower”) of the “northern” types shrines built at a relatively late date. They are called yoginīmukhas (yoginī heads) and presumably represent one of the minor female deities or demonesses who follow Durgā. In certain other parts of India, lions or other figures occupy this position. The style or approximations to it is most often seen in small brass heads from the same regions of western India and, except for folk art (there are traces of folk style here), represents the final purely Indian stylistic development there before the admixture of European elements.